On May 21st we arrived in Ars, France. We had the bus driver drop us of about a 45 minute walk outside of Ars so that we could walk the same path that St. John Vianney did when on his way to become the parish pastor. As the group of men prayed the Rosary it was hard not to think that the Cure was probably doing the same thing as he traveled on his way. Many of us after arriving to Ars went into the town and visited the Basilica where St. John Vianney’s incorruptible body is in repose. Praying before the saint was a very powerful experience for a lot of men. We all understand, that when our journey at seminary is over we will (God willing) be priests and eventually pastors, to be kneeling before the patron saint of parish priests was a great blessing that God gave us and it helps us to understand the duty we are going to be entrusted with, that of the salvation of souls. On May 22nd Fr. Eric took all of the men to the Church were Jesus revealed to St. Margaret Mary his Sacred Heart and told her of his mercy. Seeing the place of the apparition that started one of the greatest devotions in the Church inspired a sense of awe that lead everybody to prayer. We had the opportunity to attend Mass in the small church and afterwards Fr. Eric brought out a relic of St. Margaret Mary, her finger, and we all had the chance to venerate it. Later on in the day we went to the Monastery of Cluny where in the middle ages was started one of the largest religious orders of all time. We had the opportunity to go on a tour of the ruins of the monastery and to see how these monks lived hundreds of years ago. It was really beautiful to be in a place that produced popes, cardinals and many holy monks throughout the time that the monastery was up and running. On May 23rd we all went to Lyon France and visited the Basilica of Notre-Dame de Fourviere. This church was built in thanksgiving to the Blessed Virgin Mary for saving Lyon from a cholera epidemic. 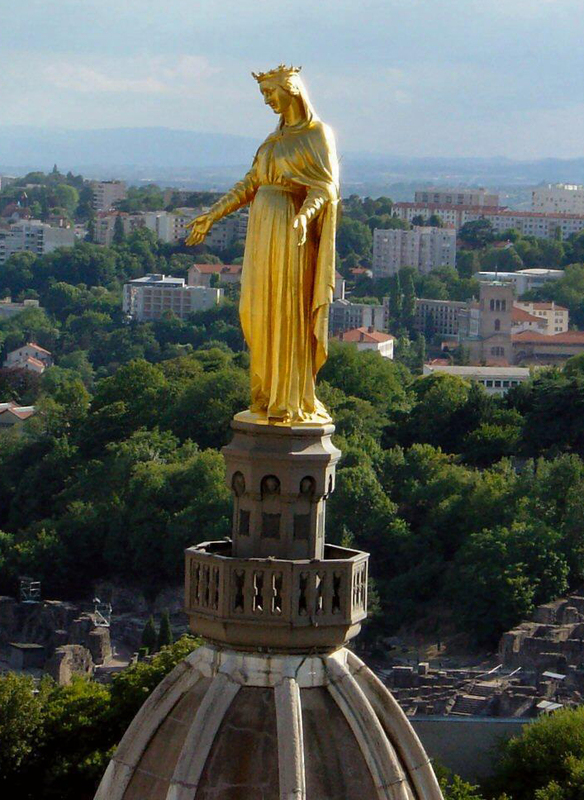 Then during the Franco –Prussian War the town was saved again by the intercession of the Blessed Virgin when the troops looking to invade Lyon retreated. This church is filled with mosaics and statues honoring Our Lady and many other saints. The architecture and art in this basilica are truly breathtaking and give appropriate glory to God. Tomorrow we all go on silent retreat for a few days and we are all very excited to see how God is going to work through Fr. Chris our retreat director. Please keep us in prayer. REFLECTION: One of the beautiful things about going to the church where Jesus revealed to St. Margaret Mary his Sacred Heart and celebrating Mass is that we are able to see that Jesus even now reveals himself to all of us in the Eucharist. No matter where we go to Mass Jesus is always revealing himself to us making known the mercy of his Sacred Heart. If you are a Rome Experience seminarian or alum, please keep in touch and KEEP THOSE PICTURES AND JOURNAL ENTRIES COMING! Announcing – New Blog and Website!